The global acoustic insulation market is poised to depict a remarkable growth in the upcoming years, owing to a rise in stringent regulatory policies and norms with regards to the greenhouse gas emission levels in the atmosphere. The rising consumer expenditure coupled with new favorable housing schemes in both developing and developed nations will steer the growth of the overall acoustic insulation market. 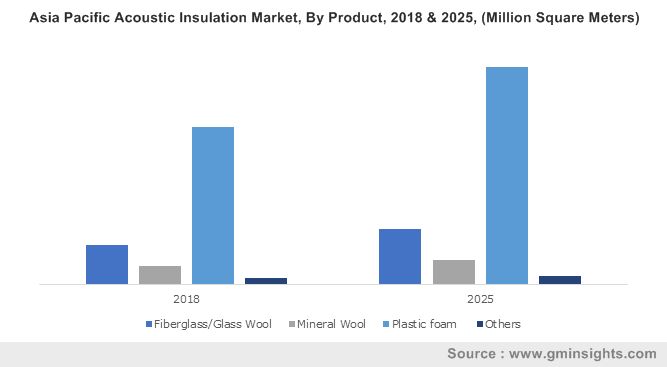 Moreover, a hike in deployment of online sales channels for distribution along with rising standard of living will also serve to propel the acoustic insulation market share over 2018-2025. There has been a massive surge in the concern pertaining to employee comfort level lately, due to an increase in the demand for a noise-free environment. This has led to major companies spanning myriad industries to implement suitable measures on the work floor to ensure worker safety and comfort, leading to a spike in acoustic insulation industry size. The industry has also been influenced by an influx in construction spending and rapid industrialization in the developing economies like Brazil, UAE, Saudi Arabia, Mexico, India and Malaysia. The requirement for energy efficient buildings with sound dampening, recovery in building and construction expenditure, and stringent building codes will thus drive acoustic insulation market share in the coming years. Notable investments in the R&D sector made by industry players due to the continuous technological advancements and innovations in the industry will further boost the business outlook. For example, Recticel Insulation raised its R&D expense to USD 16.34 million in 2017, from USD 15.35 million in 2016. An upsurge in the transportation industry share due to a rise in consumer demand for comfortable driving experience and sound-proof vehicles will also propel the acoustic insulation market. The building and construction sector is estimated to be a viable revenue stream for acoustic insulation market, given the product demand across the global construction domains. The robust development in infrastructure around the world and the advancements prevalent in the building and construction sector will prove to be a major growth impetus for this industry, specifically across the developing nations. A report from the Construction Intelligence Center (CIC) of Timetric, and the Bureau of Labor Statistics, projected the construction industry to be among the fastest growing industries. With a commendable projected growth rate, the sector is touted to be one of the leading verticals as far as employment and wage growth is concerned. Indeed, the global construction industry is touted to comfortably secure its position in the worldwide trillion-dollar business cosmos by 2020. The robust advancement of the construction domain would quite overtly, augment the demand for sound-proofing in buildings spanning the residential, commercial, and the industrial sectors, thereby expediting acoustic insulation industry size from the building & construction sector. The transportation sector is bound to come up as a major application avenue for acoustic insulation market. Owing to the ever-escalating demand for vehicles and automobiles across a slew of domains, the transportation sector is slated to witness a major upsurge globally in the years to come. As per reliable estimates, the transportation industry is said to account for 6% to 12% of the GDP in most of the developed nations. Considering a broader perspective, including logistics costs and more, transportation assets may easily account for 6% and 25% of the country’s GDP. Furthermore, the value of all transportation assets, including vehicles as well as infrastructures, could easily account for half the GDP of a country with an advanced economy. As the global transportation industry share surges by the hour, the demand for soundproofing and low engine noise is bound to escalate. This in consequence, would majorly steer the growth of acoustic insulation market from transportation applications. As a matter of fact, the transportation segment led the overall acoustic insulation industry in 2018, with a demand share of around 25%.In the years to come, the requirement of automotive soundproofing will gradually drive acoustic insulation industry size from transportation applications. Powered by an extensive application spectrum, the global acoustic insulation market is expected to renewed traction in the ensuing years. For the record, the valuation of the overall acoustic insulation market is estimated to cross a colossal of US$17 billion by the end of 2025.